Instagram Stories is a short time post that will automatically expire after 24 hours. You can personalize your Instagram story. You can add stickers, filters, face masks, emoticons, hashtags, etc. 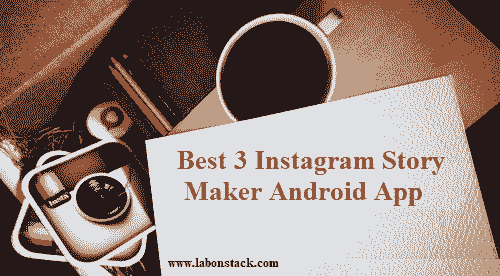 Here I have listed 3 Instagram story maker android apps for you using this app you can personalize the story. Using this app you can add beautiful story templates which you can customize to make attractive stories. These all app provide a dozen free unique templates where you can add your text, photos/videos, styling and upload it to Instagram or save it to your phone. Unfold is a toolkit for storytellers. Create beautiful and engaging stories with minimal and elegant templates. This app offers 25 free templates that you can use to make beautiful Instagram stories. To make your story post, select the desired template and add your media by tapping on the “+” icon(s). You can choose a font face and color for the text and scale it for a perfect fit. While designing your story, you can anytime see a preview of the story. Use Unfold toolkit, editor and designer to create story collages with styles, white borders, and custom font & text with photos and videos. Once the story is final, you can save it to your phone in high quality and post on Instagram. You can use StoryArt and be a story artist. This app has over a dozen free templates where each template further has around 10 design layouts. For the text, you get unique text designs which are very attractive and stylish. StoryArt can help you easily create the beautiful story by remixing your own photos, which will make your story unique and popular. After making the story, you can preview it in the app and save to your phone. You can post it on Instagram directly from this app. Story Maker is an app that has dozens of templates and resources for you to create beautiful stories to share on Instagram, Snapchat, Whatsapp, Facebook, etc. This app has dozens of templates with unique layout and all these templates are free. A free and easy-to-use app to choose from among our many templates. Customize the background of your story and choose images from your gallery or camera and it’s done! you can share it. Don’t waste time, install and test now one of the best apps to create stories. While adding a photo, you can scale it to fit perfectly in the layout. You can also keep your story minimalistic with a plain colored background. You can also customize the text by choosing a font face, color, size, and other formatting options. In the end, you can save the story to your phone or post it directly on various social media platforms including Instagram, Facebook, Snapchat, etc.